The car-size NASA rover on a Martian mountain, Curiosity, has begun its long-anticipated study of an iron-bearing ridge forming a distinctive layer on the mountain's slope. 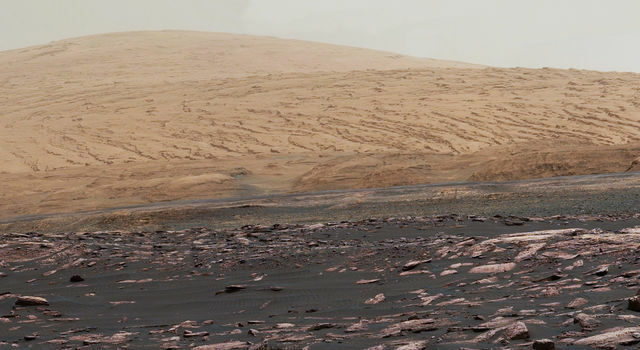 Since before Curiosity's landing five years ago next month, this feature has been recognized as one of four unique terrains on lower Mount Sharp and therefore a key mission destination. Curiosity's science team informally named it "Vera Rubin Ridge" this year, commemorating astronomer Vera Cooper Rubin (1928-2016). "Our Vera Rubin Ridge campaign has begun," said Curiosity Project Scientist Ashwin Vasavada of NASA's Jet Propulsion Laboratory, Pasadena, California. "Curiosity is driving parallel to the ridge, below it, observing it from different angles as we work our way toward a safe route to the top of the ridge." A major appeal of the ridge is an iron-oxide mineral, hematite, which can form under wet conditions and reveal information about ancient environments. Hematite-bearing rocks elsewhere on Mars were the scientific basis for choosing the 2004 landing site of an older and still-active rover, Opportunity. 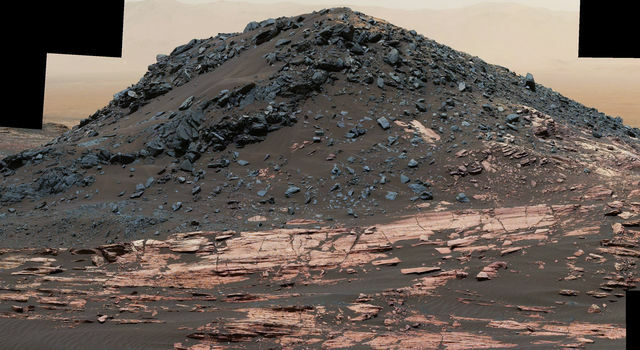 Studies of Mount Sharp with the Compact Reconnaissance Imaging Spectrometer for Mars, on NASA's Mars Reconnaissance Orbiter, identified hematite in the ridge and also mapped water-related clay and sulfate minerals in layers just above it. Vera Rubin Ridge stands about eight stories tall, with a trough behind it where clay minerals await. Curiosity is now near the downhill face, which forms an impressive wall for much of the ridge's length of about 4 miles (6.5 kilometers). "In this first phase of the campaign, we're studying the sedimentary structures in the wall," said JPL's Abigail Fraeman, a Curiosity science-team member who helped plan these observations. 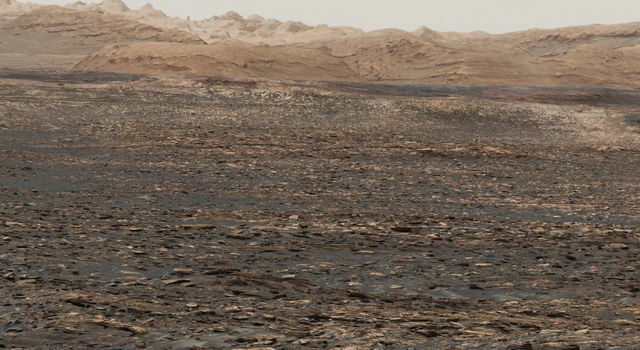 This summer's investigations also seek information about the boundary zone between the material that makes up the ridge and the geological unit that Curiosity has been studying since late 2014: the Murray formation of lower Mount Sharp, which holds evidence of ancient lakes. The Murray formation has variable levels of hematite, but whether the hematite in it and in the ridge accumulated under similar environmental conditions is unknown. The planned ascent route will provide access to closer inspection of the hematite-bearing rocks. "We want to determine the relationship between the conditions that produced the hematite and the conditions under which the rock layers of the ridge were deposited," Fraeman said. "Were they deposited by wind, or in a lake, or some other setting? Did the hematite form while the sediments accumulated, or later, from fluids moving through the rock?" Deciphering the history of the ridge's hematite may shed light on whether the freshwater environments that deposited the layers of the older Murray formation were turning more acidic by the time the layers of the ridge formed. 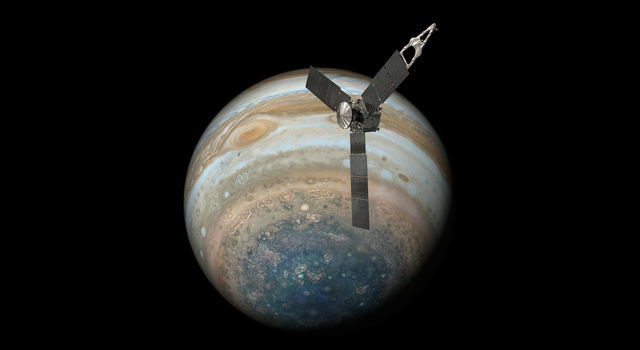 The mission also will be watching for clues about whether a gradient in oxidation levels was present, as that could have provided a potential energy source for microbial life. 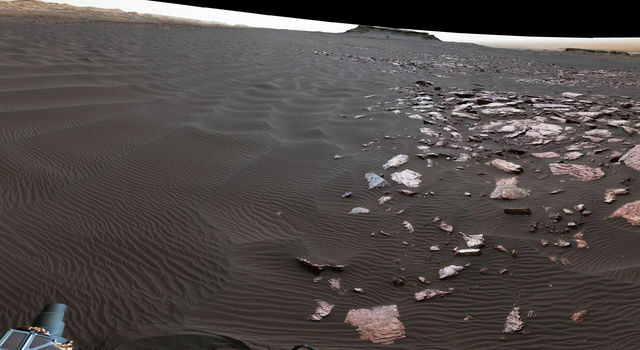 Terrain near the base of the ridge is rife with boulders and sand, creating challenging conditions for navigation, as well as opportunities to add to the mission's studies of sand dunes and ripples. 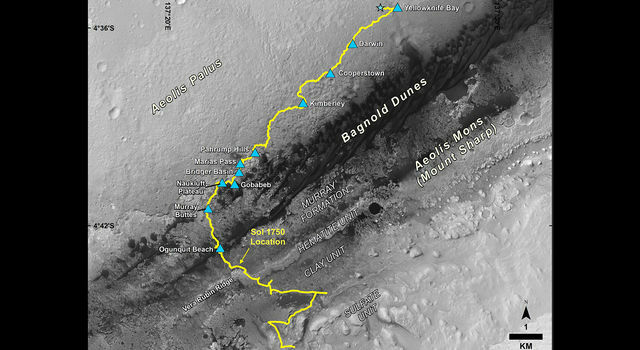 The largest sand dunes were at lower elevations, including a linear dune informally named "Nathan Bridges Dune" in memory of Nathan Bridges (1966-2017), a Curiosity team member who helped lead the mission's dune studies. The rover team will not have Curiosity's rock sampling drill available in the first phase of studying "Vera Rubin Ridge." The drill feed mechanism, which moves the bit forward or back, faulted on Dec. 1, 2016, and no rocks have been drilled since then. While continuing to test possible ways to move the bit with the drill feed mechanism, rover engineers are also now studying alternative ways to drill. For the 15 rocks that Curiosity has sampled with its drill so far, two stabilizer posts, one to each side of the bit, were placed against the rock before the bit was extended with the feed mechanism. 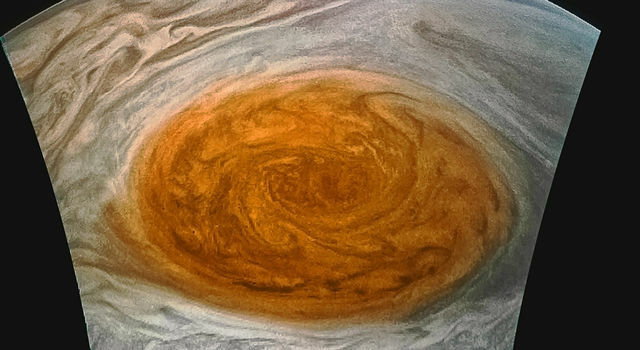 "We are investigating methods to drill without using the stabilizers," said Curiosity Deputy Project Manager Steve Lee, of JPL. "Instead of using the feed mechanism to drive the bit into the rock, we may be able to use motion of the arm to drive the bit into the rock." Adaptation in delivering the resulting rock powder to laboratory instruments is also under study, such as use of the arm's soil scoop.